Where Should a Program Be In Year 3? What should an SEC program look like in its third year under a head coach? That’s a question that is getting tossed around after the slower-than-expected start for Tennessee and Butch Jones in Year 3 of the Jones Era, a season that was preceded by high expectations for a team that was among the nation’s leaders in returning starters and finished 4-1 down the stretch in 2015 with a convincing TaxSlayer Bowl win over Iowa. I decided to take a look back over the past 10 years of the SEC to see what kind of conclusions could be gleaned about coaches and their first three years at a program. This is certainly an inexact science with plenty of variables that make it difficult to make too many iron-clad statements that fit in every case. Inherited roster, schedule, injuries and program resources all certainly play into if, and how quickly, a coach can succeed in the SEC. Jones, admittedly, didn’t have a lot of fortune in several of those areas. First, here are all the coaches hired in the past decade in the SEC (that stayed at least three years) and what their records were through three season, divided into categories based on what they’ve been able to accomplish. Coaches hired in the SEC in the past 10 years who have, at minimum, won a national title and have been able to sustain success at a program for a period of time, and/or have taken their respective programs to a previously unseen level of success for at least a couple years. Coaches hired in the SEC in the past 10 years who have done, for the most part, a solid job building their program and sustaining some success, showing some flashes of brilliance in the process. Coaches hired in the SEC in the past 10 years who showed evidence that they could briefly build their team close to a championship level but then went off the rails shortly after for various reasons. Coaches hired in the SEC in the past 10 years who just didn’t get it done. Despite early positive return for Jim McElwain and negative ones for Derek Mason, there isn’t enough data on those two yet to factor into this conversation. But four coaches – Bret Bielema, Gus Malzahn, Butch Jones and Mark Stoops – are in the midst of that third season, the year that many feel coaches can be somewhat fairly judged. What then can be learned from the past 10 years of SEC coaching hires? Every coach in either the “unquestioned success” or “getting the job done” category reached the eight-win plateau at least one time within their first three years. Seventy-five percent of them reached eight wins at least twice in the first three years. The average number of wins in their third year was 9.25. On the other end of the spectrum, every coach in the “unquestioned failure” category did not reach eight wins at any point in their first three seasons. The average number of wins in the third year for this category is three. At least with this somewhat limited set of data, we can deduce that three years can often tell if a coach will be able to have sustained success in this conference. It better serves as an eliminator than a certifier of long-term success, however. Remember the other category – the flameouts. Petrino is a bit of an outlier/oddity because of the role that personal issues played in his firing. But the first three years predicted great success for Gene Chizik, who was fired after his fourth season (3-9). Muschamp well exceed the eight-win plateau within his first three years, but then had a sharp downturn. So far, Malzahn is the only coach currently in Year 3 that reached the eight-win plateau. Again, that doesn’t guarantee success according to recent history, and perhaps his slower-than-expected start in 2015 suggests that he’s headed towards same route of his predecessor, Chizik, to the flameout group. The data does, however, suggest that right now he has the best chance of the aforementioned coaches to have long-term success. 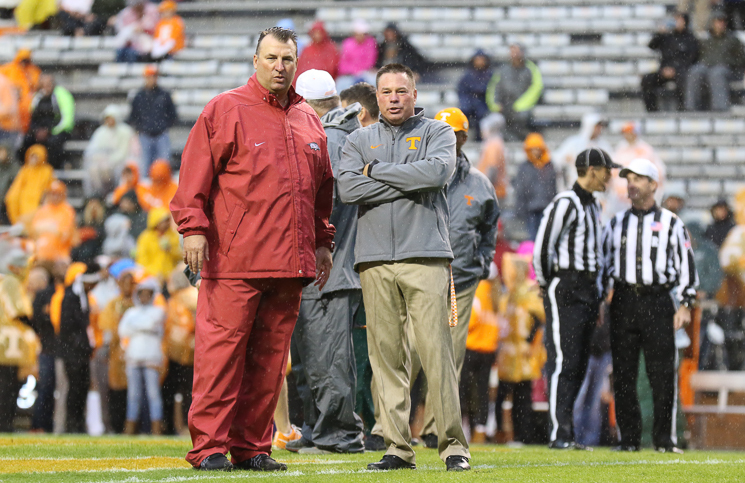 And for Jones, Bielema and Stoops – the race should be on to get to eight wins this season. That’s not to say that any or all should or will be fired if they don’t get there. But the recent history of the SEC shows that if they don’t get to eight wins by this year, they very well may never be able to do it – or at least they will never be able to get the program to a championship level. Going back all the way to the divisional split (1992), only one coach who hasn’t won eight games at least once in his first three years has even won a divisional title (Jackie Sherrill, Mississippi State, 1998). No SEC Championship coach since that time started out without at least one eight-win season in the first three years. Three years, as a general rule, have been enough to indicate if a coach can be a champion in the SEC or not. For Tennessee, that doesn’t mean Jones has to go if the Vols don’t get to eight wins this year. As mentioned at the beginning, many of the variables have been stacked against him. But it’s an interesting historical perspective and one to keep in mind going forward as the Vols make decisions about the future.